$25 Ross Dress For Less Gift Card Giveaway! Fine Print: I was given a gift card and Ross Dress For Less is giving another to a winner. All opinions and statements above are my own. The prices at Ross are typically between 20-60% off department store prices, so Ross is your best go-to source to find your favorite brands for less. And let me be clear – they DO carry name brands! Whenever I need new business casual clothes for myself or clothing for my kids (particularly sweaters, sweatshirts and t-shirts), I make a trip over to Ross. You never know what you’ll find, but I do always find something great! In fact, one of my favorite shirts that I wear for business is from Ross and I always get compliments on it. That is what keeps me going back! They also have great deals on household needs! To get everyone excited about the new Ross locations, I am giving one lucky winner a $25 Ross Dress For Less Gift Card that can be used at any Ross location in the country! To enter this giveaway, complete any or all of the options listed below. Giveaway ends 8/8. Good luck! would look in the shoe department. Love Ross. Great things for great prices!!! I would look for blouses. The clearance race in juniors! Shoe department is where I go first at Ross – my family always needs new shoes it seems like and Ross has great deals on shoes! The shoes first everytime I am there. I love Ross. Was planning to look for backpacks there for my kids. This would be very helpful for that. Ross is my favorite store! I would look through shoes first. I go the go to the home department first , Thank you! I would look at the Home Goods section first. I would look through kids shoes first. I love Ross Dress 4 less…..even before I started couponing. It’s one of the best stores to shop when your families on a budget. I’d head straight to the women’s clothing! I would like to look at their home decor section. I need some new pieces. I would look in the home department. I’d start in the shoe department. I would look at the women’s dresses. I would look through the juniors department for some clothes for my daughter for back to school. I go look at the dresses then the shoe section. I would look through housewares first! Thank you for the wonderful giveaway. I love finding crafting supplies! Thank you for the great giveaway! I would shop in the kitchen department first. I could use some new pans. I would look at the Petites department. Oh I love Ross so much! I bought my bridesmaid dress for my sisters wedding there. I’d probably look for some new jeans for me. I would look at the bed and bath department first! I usually look at accessories first. Love shopping at Ross! You never know what you’ll find, but it’s always fun to look and even more fun to find a great bargain! I’d look at the baby department first. The dress section would be my first stop! I think I would go to the home section first, then women’s dresses. The housewares department would be first and then onto the clothing. I check clearance sections first. i always go straight to the back to the home decor section! I look at the Women’s tops first! I love Ross for home decor and kids clothes! I would look at the children’s clothes first. I would look thru the kids section first and then probably the plus sized clothing. I’d look at purses. I need a new one. I look at the kitchen gadgets. I love Ross! 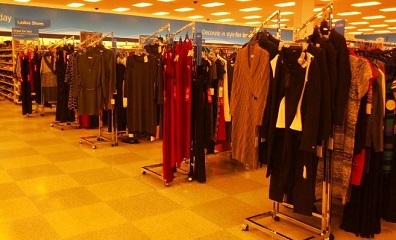 I go throughout the entire store, but I start in my section–misses/women’s! I haven’t been to our local Ross yet, but I’d probably head to the girls’ section first. I’d head straight to womens shoes. Sounds funny maybe but the bra department as I really need new ones! I would look for dresses first. i would look at shoes first! Either purses or kids stuff. I love buying for my son. I would go to the woman’s clothes section first. The Ross Dress for less I have gone to before wasn’t very big so none of the sections were very far from each other. id look through the shoe section first! I always go straight to the jeans! I would look at shoes. I would look in the shoe department. I love their tops. A great selection! !